While wasting time… I mean actively looking for inspiration in Pinterest, I came across this image. It stopped me in my tracks. We hold on too tightly, don’t we? We never let it go even though we say we have. There’s a tightness deep down inside that only we are still aware of… and I think it’s time to release it. 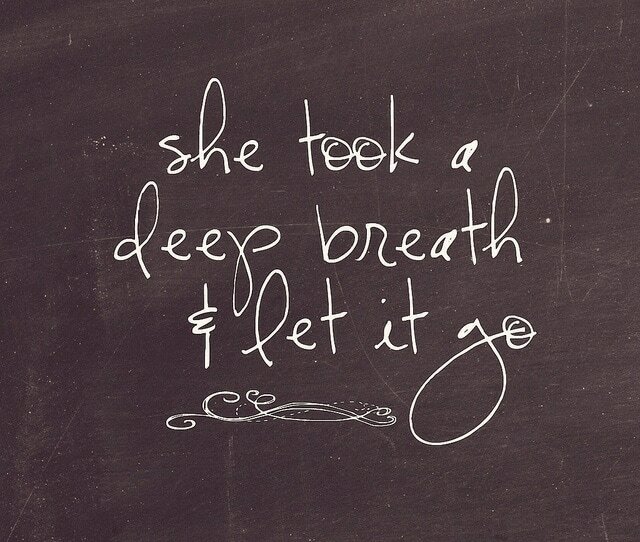 She took a deep breath and let it go. What a powerful visual. Exhale out that grudge. That hurt. That memory. You’ve given it real estate long enough. This week’s challenge is simple. Think of something you’ve been holding onto for longer than it deserves. Now…. Let. It. Go. You don’t have to say WHAT you let go. But if you made an effort, leave a comment below. I let go of some expectations I’ve been having lately. Expectations that will never be met. Expectations that will always be too far out of reach. I feel lighter already. Previous Post: « 52 Fabulous Bangles: Talk About Arm Candy! Breathing out and letting go of stupid drama that doesn’t affect me directly…. I have let go of the image of societies “perfect” relationship. My boyfriend and I have been together 7 years, and around year 4 I felt the marriage bug. But that’s not in his cards. We fought, broke up, got back together and broke up again. This time around – neither of us has ever children – we are looking at it from a different perspective. We love each other and want to be together. And that’s it. No marriage, no binding laws, just us in our relationship. I love this quote… what an inspiration to just MOVE ON and LET GO! Thanks for encouraging me today… this really speaks to a few things I’ve been struggling with lately.